Hello Dealsnloot Readers,Now freecharge has come up with a similar concept named “Freecharge Go Shopping Fest” where they are giving upto 70% discount + additional 25% cashback on websites or apps like Jabong, Limeroad, rebBus, Goibibo, Travelyaari, FreshMenu, Zomato, FernsNPetals, Giftxoxo, PeperTap, Voonik, Swiggy. The offers are valid from 11th feb-15th Feb only and you can avail 25% cashback a max of two times during the offer period.Grab This loot Deals and Get loot Cash Back By Freecharge Offer. 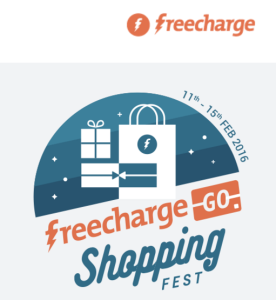 How to participate in Freecharge’s “Go Shopping Fest” ? Applicable on all except Gold Coin, Precious Jewellery, Innerwear, Beauty, Tommy Hilfiger, Casio, Gini & Jony. Valid only on LimeRoad App. Offer valid between 2400 Hrs., Wednesday, 11th February, 2016 – 15th February 2016 (“Offer Period”). Maximum Cashback is capped at Rs.100 per transaction/user /mobile number. Cashback valid only on 2 (two) transactions using FreeCharge Go MasterCard per user/mobile number at any of the Merchants websites participating in the Offer during the Offer Period. Cancelled orders will not be eligible for any Cashback. In case of order cancellation, refund will be processed in the FreeCharge Go MasterCard within 3 to 5 working days. Cashback will be credited to the FreeCharge Go MasterCard within 24 hrs. It can be redeemed within 185 days from the date of credit. Cashback is nontransferable and non refundable.